Your Wi-Fi network's name (called your SSID) identifies your router so you know which network to connect to, but considering how often smartphones pop up connection notifications, your network's name can also act as a medium for delivering messages to fellow Wi-Fi users—or even scare passersby off an open network. We've covered the topic of using your wireless router's SSID name to just plain harass your neighbors, and we've even suggested using it to discourage neighbours from leeching your Wi-Fi and rounded up some clever names for doing that, but what if you don't want to be a jerk for no reason? In addition to changing your Wi-Fi to something scary such as "IllegalActivity" or "ISeeWhatYouAreDoing" in order to scare off people from leeching onto your network, you can also use it to send a message. "Apt112IHaveYourMail" can tell people to come to you to get their mis-delivered mail (though why you wouldn't just put it into their mailbox is beyond me). "TurnDownYourMusicPlease" is useful for considerate neighbours that don't know their sound is bleeding into your space—but not useful for those who don't care. Other messages like "PartyNextFriday303PleaseAttend" is cooler (though maybe less effective) than going door to door and slipping a printout in the crack, and "LostDogCall2125551234" is pretty self-explanatory. If you're really intent on causing problems for jerky neighbours, options like "DogAbuseIn411" can deliver your messages of harassment with very little effort. 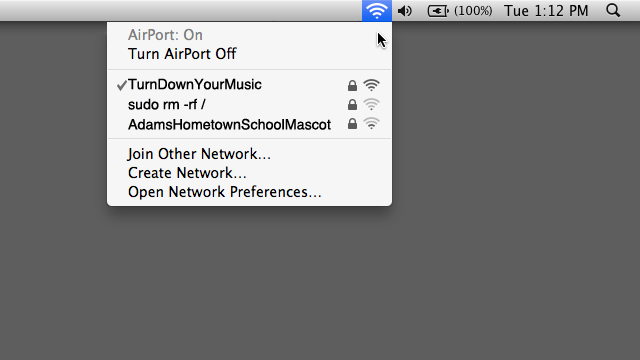 Probably the most evil thing you could try: Change your SSID to the name to the name of your neighbour's Wi-Fi. If you could manage to program your DD-WRT router to log incorrect login attempts (this script and this page on brute force attacks are the closest we could find), you could in theory capture your neighbor's Wi-Fi password, then subsequently leech off their internet. Of course, we trust you wouldn't do that anyway. Got a clever SSID usage of your own? Let's hear it in the comments. What is this rubbish? I propose Lifehacker AU stop reposting US articles, because this is absolute trash. I'm not even frustrated by its questionable antics - it's just, from start to finish, a bad article. The cleverest one I've seen was '4tupperware'. In a big, high density apartment complex in an area where a lot of people and guests came through, with a lot of foot traffic outside the building - I bet a LOT of people saw that bit of advertising. Even my friends are reluctant to connect to it. I can walk along with my phone and find the house with the strongest signal strength for a particular SSID. by doing that i found out that your ssid is hansoloyolo. lol! I DIDNT KNOW YOU COULD HAVE A PASSWORD ON MY WIRELESS!!! An ssid won't "scare off leechers", however a good password and encryption will. Mine is called "pretty fly for a wi-fi". I stole it from an article similar to this. I set one up for a friend... Usually I would hide the SSID, but this one didn't allow for the option so we went with "XxXxX Police", "XxXxX" of course being the name of the local police.. I'm not sure if this would attract and detract hackers, but it's interesting. I find my spare wifi router with the SSID "Free Pr0n" that redirects to a capture page full of nasty german pr0n popups really fun. You can hear my neighbours disgusted screams from across the road. But on your main SSID, just use a WPA2 and you shouldnt have any toubles. I called my HTC wireless hotspot "FBI Surveillance Van #2"
My Guest SSID is Pretty Fly For a WiFi. Previously have had: ASIO Surveillance, 4Q2, Virus Breeding Ground, Go 4k urself, immi.gov.au, ICU, H4x0r3d, NoInternet4U, GetYourOwnNet, Nyet Nein No Nix, SAPOL, LemonParty. Use an SSID of "PedophileNET"
Best not to use a common SSID to beware of rainbow tables, the longer the SSID the better.